This sophisticated dish takes a lesser known part of the fish and jazzes it up as a sensational starter. For the cod cheeks, blend the bread to crumbs in a food processor, then add the lemon zest and pulse again to combine. Tip the mixture into a shallow bowl and clean the food processor. In batches, dust the cod cheeks in the flour, then dip them in the beaten egg, then roll them in the breadcrumb mixture until completely coated. Place each breaded cod cheek on a plate. Cover with cling film and chill in the fridge until needed. For the salsa, blend the peas, mint, chillies, lime juice and crème fraîche in the food processor to a rough paste. Tip it into a serving bowl, cover and chill until needed. Carefully lower the cod cheeks into the hot fat in batches, and fry for 2-3 minutes, or until golden-brown and cooked through. Remove from the oil using a slotted spoon and set aside to drain on kitchen paper. Repeat the process with the remaining cod cheeks. 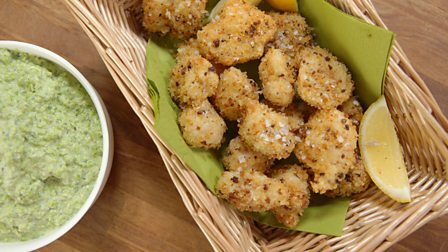 To serve, pile the breaded cod cheeks onto a serving platter. Place the lemon wedges and the bowl of pea salsa alongside. Tip 1: Cod cheeks are solid lumps of meat with a membrane running through them, which needs to be removed – ask your fishmonger to do this for you. If you can’t get hold of cod cheeks, cod fillets will do. Tip 2: Both the cod cheeks and the salsa can be prepared one day in advance and chilled to make your dinner party run smoothly.